Figure 4.34. Empty weight is less if total volume is less. ACES is heavier because volume is greater. (1) The structural concept for an insulated cold primary structure is an important decision that can have a significant impact on vehicle empty weight. 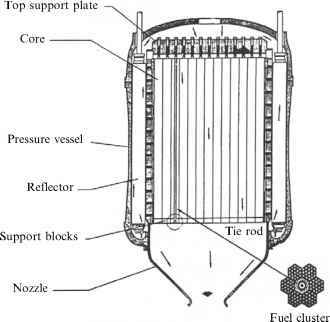 For launchers passive thermal protection is more than adequate. However, for a cruising vehicle passive insulation permits too much of the aerodynamic heating to reach the cryogenic tanks, and an active heat removal scheme is required. Pegg and Hunt employed fuel as the heat transfer agent. Others include water, water-saturated capillary blankets, and other phase-change materials between the backside of the shingle and the integral tank structure outside surface. All of these are appropriate for most of the structure for a blended body or all-body configurations. The leading edges are based on sodium heat pipes that move the thermal energy to a lower temperature area or a heat exchanger. Control surfaces are a case-by-case basis and each is designed based on configuration and local flow conditions. In terms of the total vehicle and an advanced concept initial sizing, these have minimal impact on the final size and weight. But if the reader wishes to refine the estimate, the values in Table 4.7 can be improved by the following first-order correction that assumes the leading edges are 10% of the total surface area, and the control surfaces are 15% of the total surface area. These corrections are based on values from [Anon., HyFAC, 1970] for an operational vehicle. So the VDK CURRENT structural index would become 21.6 kg/m2. (2) Given the thermal protection system and structural concept, the next most important determinant of the empty weight is the total volume of the vehicle (Figure 4.33). In some cases the total volume is a response to the change in oxidizer-to-fuel ratio; in other cases it is the inherent volume of the propulsion concept (ACES and PDE systems) as shown in Figure 4.34. (3) The gross weight is a direct result of the weight ratio to orbit (Figure 4.32), which is determined by the propulsion system oxidizer-to-fuel ratio (Figure 4.29). (4) The threshold value for the oxidizer-to-fuel ratio and weight ratio that clearly separate airbreathing systems from rocket-derived vehicles are 3.9 and 6.5, respectively (Figures 4.31 and 4.32). At these values the OWE for a launcher with a 7-ton payload is 71.48 tons and the gross weight is 510 tons, less than the 690 tons for the all-rocket. (5) The ACES system for an SSTO will have a greater volume than a corresponding ejector ram-scramjet propulsion system: even though the weight ratio and oxidizer-to-fuel ratio are less, some of the weight ratio and oxidizer-to-fuel advantages may be offset (Figures 4.31 and 4.34). (6) Because of the reduced pumping system weights and the lesser installed volumes, the pulse detonation propulsion systems will have a lesser volume and less weight than a corresponding sustained operation propulsion system. rocket with a gross weight of 690 tons, liftoff thrust of 932 tons, and a propulsion system weight of 16.9 tons. The exceptions were the air augmented rocket in which an ejector structure was added to the airframe, the ACES system in which the air separation system was added to the LACE or deeply cooled air-breathing rockets, and the PDEs where the conventional turbopumps were replaced by lower-pressure-ratio turbocompressors (Figure 4.30).